The Festival of Voices is Tasmania’s leading winter cultural event and Australia’s premier festival celebrating the vocalist and the power of song. 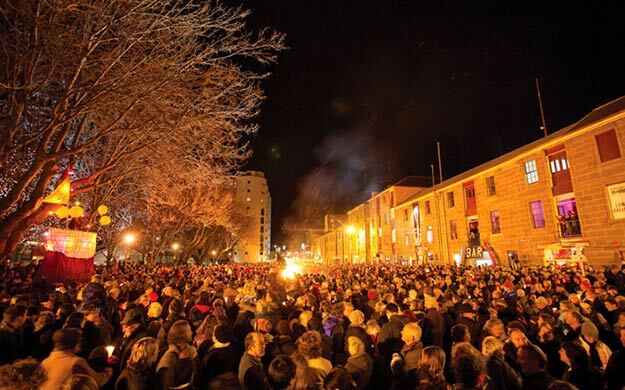 Festival of Voices (FoV) is Tasmania’s original marquee winter event. It is Australia’s premiere celebration of the voice. It started in 2004 in response to a brief of how to activate Hobart in the middle of winter. It was decided that it would be a good idea to light a bonfire in the middle of the city and have a sing along. The idea caught on, and today FoV attracts audiences of 30,000 people over a two-week period in July. The Festival of Voices is an inclusive event of learning, performing and celebrating that is unique in Australia. For more information on this years festival, go to the Festival of Voices website. Image Credit: Courtesy of Festival of Voices.